Photographing my son weekly as part of a photography project means I look closely at him in a way that I might not otherwise pause to do. 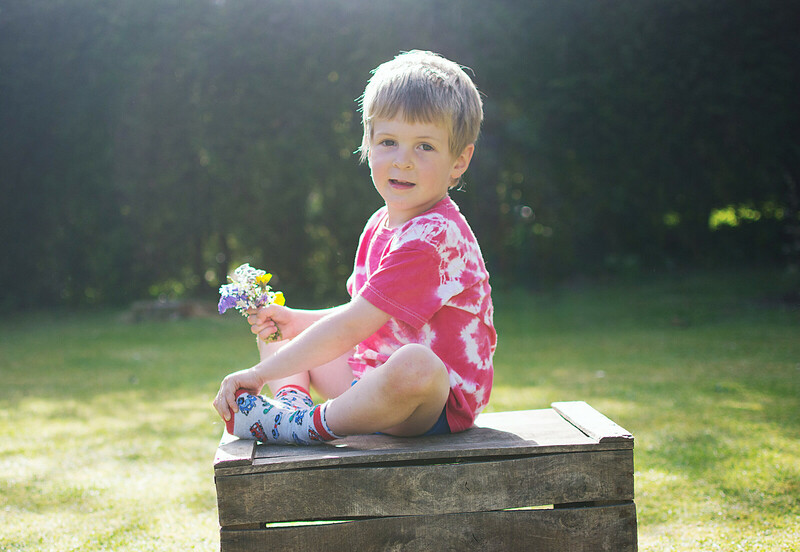 Most of the time the images staring back at me make him look assured and older than his years, but just occasionally I capture a dwindling moment of his little boy innocence. Our Sunday yesterday was a lovely family day. Following a cold and overcast morning the sun suddenly appeared and as we were having lunch at my sister’s, the cousins had a chance to play in the garden. Theo’s cousins are a decade older than him and that age gap means that he has a wonderful way of making them let go of their teenage reserve and it works both ways, the age gap is so big that Theo doesn’t try to compete with them as he might with other children closer in age, instead he just gets swept along with their games and allows them to take control and look after him. In a few weeks time, our family are all going off on holiday together. Last time we did this it worked brilliantly, with Theo keeping the teenagers occupied and the teenagers being like mini au pairs for the week. I hope this trip is as mutually beneficially for everyone! PS – I can’t believe it is haircut time again, but looking at these photos it rather appears it might be – I’m not sure I’m ready for the trauma again! Like this post? Please consider nominating me for the Photography category in the Mad Blog Awards. You can read more about why in this post. When our children were Theo’s age we always rented a large house and went on holiday as a huge extended family. We all loved it, little cousins can roll around like puppies, bigger ones can just chill, mums can catch up and dads, well the dads just liked a ‘Man Beer’! You’ll love it! Have a great holiday, I hope it goes well and looking forward to reading all about it. Beautiful photos as always. Stunning photos. You really have captured some of that innocence, and the light it’s magical! Beautiful photos, Theo is *such* a handsome boy. I am the same, my cousins are all 10 + years older than me and I loved hanging out with them and when they came to babysit! Beautiful photos Clare, I love the sunshine backlighting them.